Pokhara–The 20th Pokhara Street Festival 2018/019 is to be organized from December 28, 2018 to January 1, 2019 at touristy center Lakeside in Pokhara. Restaurant and Bar Association Nepal (REBAN) Pokhara is organizing this festival to promote this lake city as a destination of New Year celebration. According to REBAN Pokhara Chairman Budharaj Bhujel, a lot of foreigners including domestic tourists arrive Pokhara to celebrate street festival as it has been developed as a renowned tourism brad which is a concept of REBAN Pokhara adviser Ganesh Bahadur Bhattarai who started this festival some 19 years ago in Pokhara following his then visit to Goa which is also a place of celebration and carnivals. 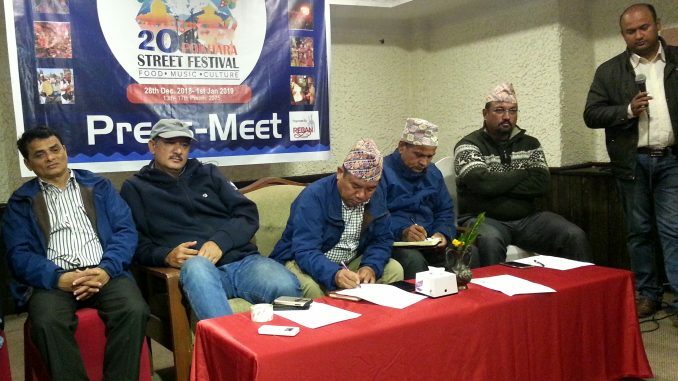 Pokhara Street Festival will take place in 3 km long distance of Sahid Chowk to Khahare and Dihiko Patan. REBAN Pokhara former chairman Surya Bahadur Bhujel informed that the festival has emerged as a grand event as thousands of visitors reach Lakeside during this event every year. He further informed that REBAN Pokhara is trying to bring the cultural groups from Japan, China, Korea and India to the festival. REBAN Pokhara immediate past president Chau Bahadur Gurung informed that the performance of duet songs from national artistes, live concert, children park, documentary show, handicraft items, fun games, national and international food items and cultural shows will be the major attractions of the festival promoted by Nepal Tourism Board.